Thanks to +Russ for the photo. I remember back in college when I’d be going to hang out at a friend’s house, we’d typically all bring a six-pack that we’d take down ourselves. There wasn’t a whole lot of sharing. Breaking up six-packs to buy single bottles wasn’t an option, and the number of 22oz or 750ml bottles of beer on the market back then was pretty limited. If you wanted a good beer for at home it meant you were usually grabbing a sixer. Flash forward to the present day, and the retail landscape is drastically different. 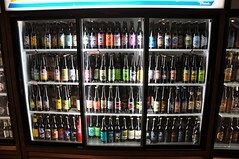 If you walk into a local bottle shop you’ll find coolers full of single 12oz beers, as well as beers in larger sizes. 22oz bottles are the most popular, but wine bottle-sized 750ml corked bottles are also common. Six-pack sales are still a large driver of volume for grocery stores and larger retailers. But, single bottle sales are driving the current day craft beer revolution at local bottle shops. In our fridge at home, it is rare that you’ll find a six-pack of anything. It is likely that you’ll find more single bottles of craft beer than my wife would like to admit. There are a lot of factors that have driven the switch to single bottle sales, but one driver is that many beer drinkers like to try a variety of beers. Rather than invest in a six-pack of something you have never tried, it is ideal to be able to pick up a single bottle, large or small. Breweries also often release special beers in larger single bottle sizes, as well as high alcohol offerings and beers that are more expensive to brew. To put beer in six-packs, breweries need to be able to commit to having it regularly available in large volumes. With single bottle releases, breweries can change their offerings more frequently. Lucky for us in Washington state, even if a beer does come in a six-pack most retailers will allow you to just buy a single bottle of it. According to Tiffany Adamowski of 99 Bottles in Federal Way, WA, “We see more singles & pairs of 12-ounce bottles going out than entire six-packs packaged from the brewery. Most folks are mixing cross-brewery, cross-states, cross-countries… people like the freedom to take their taste buds on beer journeys.” While single bottle sales are more popular than six-pack sales, the smaller 12oz bottle is still more in-demand than larger sizes. Of 99 Bottles’ top 100 selling beers in 2011, 64 were 12oz bottles, 9 of them were 22oz bottles (6 of those were WA brewed beers), and there were no 750ml bottles. The other 27 beers were in other sizes, such as 11.2oz or 16.9oz. Another factor that comes into play is the cost of beer in different formats. Generally, a six-pack offers the best value by volume, while larger bottle sizes come out a little more expensive on a per-ounce basis. If cost is a primary concern for a consumer, then six-packs are more attractive. But, for many, including myself, it is worth it to pay a little bit extra by volume in order to spend less overall because you are buying just a single bottle and not a six-pack. In recent years, some breweries have also moved to 4-packs as a way to retail some of their more expensive, high end beers. This format is especially useful in states where you can’t break up a six-pack for single bottle sales. Regardless of what your preference is, I think we’d all agree it is nice to have the array of options when we head out to buy beer these days. With so many different styles from breweries all over the world, the choices are seemingly endless. Why do 12oz bottles of the same beer cost less per ounce than 22oz? It seems like the additional packaging for a 6 pack would make it more expensive. This has always baffled me. It’s all about the final price point for some beers. For instance, if a store sells a 22oz bottle for $4.99 the per ounce cost is about 23 cents. For a six-pack of twelve ounce bottles of that beer (72oz), the price would have to be $16.33 per six-pack to have the same cost per volume. I don’t know many people willing to spend $16 on a six-pack, but they’ll drop the $4.99 on a single bottle no problem. While the packaging might be more expensive for a sixer, they are selling a higher volume of their beer. By selling single bottles, they choose to sell less volume at a higher margin. I buy the 22’s because they are typically of a variety you can’t get in a six-pac. I don’t understand the author talking about a 22 being too big to finish. Are you kidding me? A standard english pint is 20 ounces. I try to use the bottle stopper during the week, as I really don’t need to drink a 22 of an 11% Imperial IPA on a weeknight. That said, resisting drinking the other half of an open bomber is one of the great willpower tests of our time. Ive often wonderd why a 22oz bottle? I give a thums up to the 24oz. geoff’s pt is really a good one. i used to buy the bombers all the time, esp b/c the beers were harder to get. but now, being a little smarter with my wallet, i don’t get the bombers all that much. Try it, NO they wont….. The Distributors wont honor broken up six pack and will not take them back forcing the store owner to try and sell single 12oz cans individually…. Each store has a different policy but I find that Fred Myer is almost always ok with singles and a lot of the fancy grocery stores will accommodate you as well. I usually buy singles these days. I think there are merits to 22oz bottles as an option, but I also feel ripped off as the profit margin is so much higher, at least if you compared to other beers on a $/oz scale. Seems like a bad trend for consumer value. Arkansas has suddenly started enforcing the Arkansas ABC regulation on sales of single bottles. It is illegal sell anything smaller than 16.9 ounce singles. Apparently it always has been. Hopefully this will change soon so that we don’t loose all of the headway we have made in craft beer availability.